Jubb and Cois committed to protecting and processing your personal data in accordance with the General Data Protection Regulations and the Data Protection Act 2018 (the legislation). 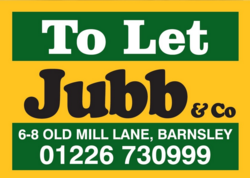 For the purpose of the legislation and your personal data, Jubb and co,is the Data Controller, Caroline Jubbis the person responsible for data protection and can be contacted at Jubb and Co, 6-8 Old Mill Lane, Barnsley, South Yorkshire, S70 2LA, 01226 730999. The personal data we process may include the information in column A of the attached appendix. Where the provision of data is a statutory, a contractual requirement or a requirement necessary to enter into a contract, a refusal to provide the data may mean that we are unable to provide our services. To ensure that we provide you with the best service possible we will need to collect and retain certain personal data. The data may be collected and processed by those listed in columns B and F. How we source the data is identified in column C. We may source data from third parties or via third parties e.g. the tenancy applicant has provided us with your information. Your personal data will be used for the activities in column D. There are six lawful bases for processing your data including consent, a legitimate interest, contract fulfilment, a legal obligation and a vital interest. For each usage of the data the lawful basis of the processing of your data will be identified in column E. A legitimate interest is when we have a business or commercial reason to process your personal data which needs to be balanced with your interests i.e. what is right and best for you. Where we state that we have a legitimate interest, the fact that we have a legitimate interest and what that legitimate interest is, will be stated in column E, e.g. to contact you to obtain a reference. When you visit our website we may collect information about your computer, including where available your IP address, operating system and browser type, for system administration and to report aggregate information to our advertisers. This is statistical data about our users’ browsing actions and patterns. It will be necessary for us to process or share all or some of your personal data with a range of individuals, businesses and organisations and these may include those listed in column F.
Your personal data is stored in the way described in column G and the data is always stored within the European Union or outside of the European Union but with an organisation operating under the General Data Protection Regulations. We will retain some elements of your personal data for up to the time defined in column H after the tenant leaves our properties. The information which can be anonymized will be that which is no longer required for either contractual fulfilment or a legitimate interest. If the lawful basis for processing your data was consent then you may withdraw such consent at any time. Where the lawful basis for processing is your consent, you may withdraw consent at any time by writing to, Caroline Jubb,Jubb and Co at 6-8 Old Mill Lane, Barnsley, South Yorkshire, S70 2LAor emailing caroline@jubb-co.com. Information held Who is collecting it? How is it collected? Why is it collected (what are we going to do with it?) Lawful basis for processing Who will it be shared with? How is it stored? When will it be deleted?